A total of 371 vehicles were towed and 1,698 tickets issued during a rush hour traffic enforcement blitz last week. Police issued $150 tickets to motorists found stopped in a No Stopping area downtown. They also towed vehicles that were unoccupied in a curb lane of a rush-hour route. Brian Moniz, the A/Officer-in-Charge of Parking Enforcement, said the blitz was very successful. “We averaged about 10 per cent more in tickets and tows during the week,” he said. There was a particular emphasis on heavy vehicles disrupting the flow of traffic. 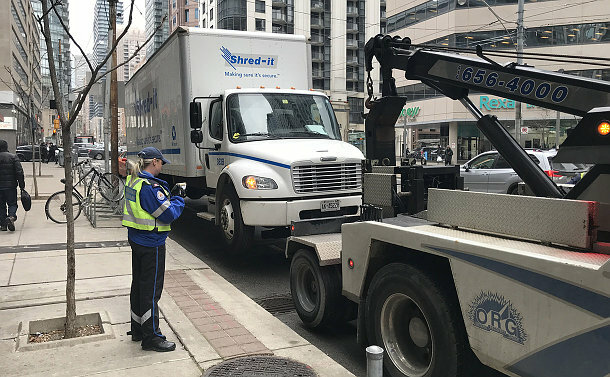 “It’s very difficult to tow shredding, food service and courier trucks, especially when they are in the downtown area. They require a special towing truck to remove them,” said Moniz, noting offenders have often left before a heavy tow truck arrives. During the blitz, police had a heavy towing truck at their disposal. “It was available to us any time during the day,” Moniz said. “We averaged about five to six tows a day and that’s quite significant. These vehicles are ticketed regularly. They are not immune to tickets, however, they see them as the cost of doing business.